This is the Mesa home you have been looking for!!! This 4bed/2bath is nearly 2,000 sq. ft. resting on a mostly FLAT 10,000+ sq. ft. lot. The downstairs features the entry, formal living room, dining area, family room, kitchen, laundry room, and ground floor master. The beautifully remodeled kitchen features granite counters, custom cabinetry, under lighting, and tile floors. The family room addition features open beam cathedral ceilings. The owners just completed new interior paint and new carpet downstairs. Enjoy mountain views from the upstairs bedrooms and a spacious hallway bath. The backyard features an open paver patio, various fruit trees, and mature landscaping. This home is centrally located between the Mesa Shopping Center, Hendry's Beach, and Elings Park. This is the Mesa home you have been looking for!!! This 4bed/2bath is nearly 2,000 sq. ft. resting on a mostly FLAT 10,000+ sq. ft. lot. The downstairs features the entry, formal living room, dining area, family room, kitchen, laundry room, and ground floor master. The beautifully remodeled kitchen features granite counters, custom cabinetry, under lighting, and tile floors. The family room addition features open beam cathedral ceilings. The owners just completed new interior paint and new carpet downstairs. Enjoy mountain views from the upstairs bedrooms and a spacious hallway bath. The backyard features an open paver patio, various fruit trees, and mature landscaping. This home is centrally located between the Mesa Shopping Center, Hendry's Beach, and Elings Park. 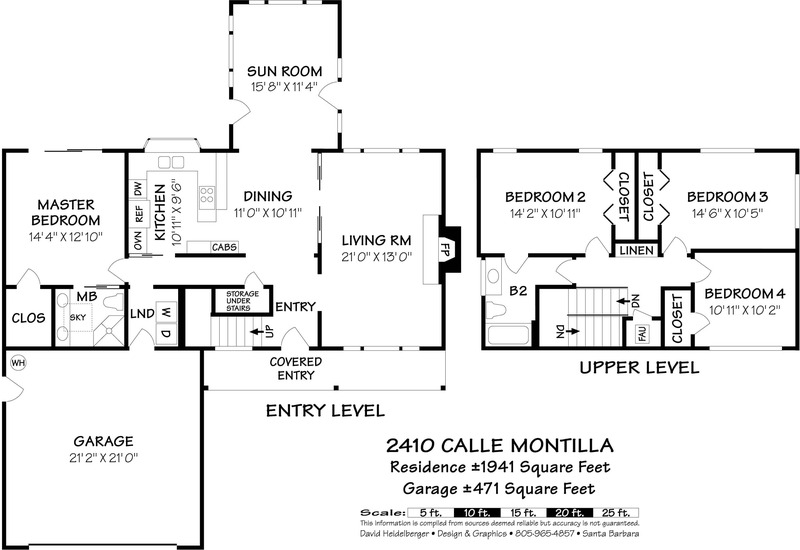 2410 Calle Montilla, Santa Barbara, CA from Mike Richardson, Realtors on Vimeo. The Mesa from Mike Richardson, Realtors on Vimeo. House Size: 1,941 sq. ft.